When we heard the Infiniti Essence Concept would feature custom Louis Vuitton bags, we made fun of it. A lot. But the car's now debuted at the Geneva Motor Show and it's gorgeous. Seriously. We weren't expecting the Essence Concept to be this staggeringly interesting. Let's get one thing out of the way real quick, that grille stings the eyes, but other than that, sweet mercy is this is a gorgeous machine. The little coves at the rear of the glass work much better than we thought, and combined with the otherwise classic touring-car proportions and glass roof, this car is a looker (as long as you don't look it in the mouth). Inside and out Infiniti really hit one out of the park, they even managed to slide in a Kaiser-like rollout trunk bed. Very slick. Inside the car is lavished with Alcantara, leather and machined aluminum as well as etched crystal and holographic gauges, you know, concept car stuff. Then there's those Vuitton bags, oh well, can't win em all. Of course, this being a show car, it features a hybrid powertrain which will undoubtedly make it into future Nissan and Infiniti projects, but nobody will talk about that because they'll be gawking at the body work. INFINITI ESSENCE: THE MAGNIFICATION OF "INSPIRED PERFORMANCE"
ROLLE, Switzerland (March 3, 2009) - The essence of the Infiniti brand distilled into one car and then taken to the extremes to satisfy the world's most demanding car enthusiasts ... this is the Infiniti Essence. Presented as a concept at the 79th International Motor Show of Geneva, Essence is a celebration of Infiniti and its 20 years history as a creator of performance cars. But equally it is an inspiring exploration into the brand's future. 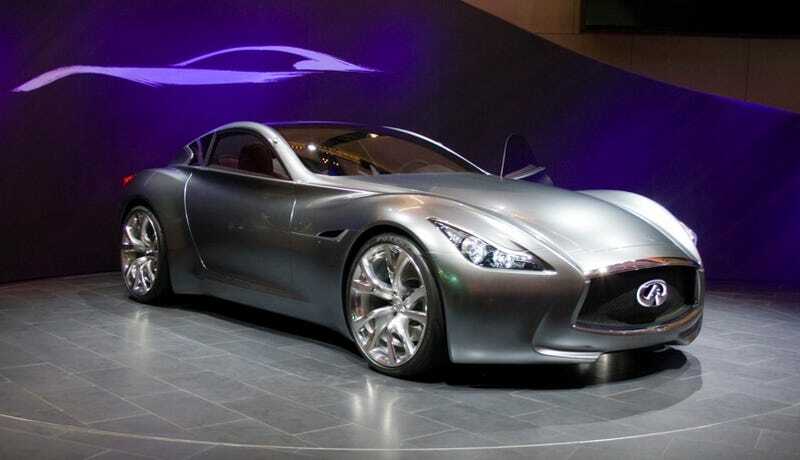 This concept embodies Infiniti's core values as an inspiration for the future as much a celebration of the past. Essence showcases many of the technologies, including hybrid, and design cues that will distinguish Infiniti production cars of the coming years. And by steering Infiniti's guiding principle of "Inspired Performance" into the super-performance, super-luxury coupe market for the first time, it reaffirms Infiniti's place among the world's most exclusive and vibrant car brands. "An Essence owner is characterized by his or her fearless self confidence; he or she is an intellectual hero rather than just a successful money maker." Essence began life not in the design studio but in Infiniti's product planning department. Francois Bancon, General Manager Advanced Product Planning, and his team might not, at the start of the project, have known how Essence would look, but they did know what it had to be, why it had to exist – and who it would appeal to. "Essence is a brand icon," Francois Bancon said. "It is driven more by a conceptual approach than by any design execution. It is not just an object. It isn't a teaser for a new model. It is solely dedicated to Infiniti brand promotion, to demonstrate and advocate the Infiniti unique values." The concept called for a very clear understanding of who the super-luxury coupe's potential customers would be. Painstakingly, Bancon and his team of advanced product planners built up a picture of a typical Essence owner. It was a profile that showed an uncompromising, risk-taking 42-year-old passionate about the best things in life, but equally passionate about not flaunting them. "These consumers don't need to demonstrate to others," said Bancon. "They are already at the next step of achievement that leads to rewarding themselves first." "The design embeds a sense of mystery, a sense of being in the know. Essence is not about showing signs of wealth and success." With breathtaking good looks and perfect proportions, Essence exerts a powerful pull on all those who love cars. It looks like a driver's car, one that would be right at home spearing down the world's grandest motoring routes. But Essence is no aggressive sports car. Infiniti's "Dynamic Adeyaka" attitude ensures Essence is single-minded, but also inviting, sophisticated and born of inspiration from both the human and natural worlds. To further boost its emotional appeal, it features details that bring a very modern take to some very old Japanese traditions. The designers' aim was to merge all existing Infiniti design cues with fresh design language in a shape that the 20-year-old marque has never before attempted. The result is highly sculptural yet also very delicate. Essence speaks of power but not intimidation. The bonnet is, as you would expect of an Infiniti, long, and the rear deck short. Together with a flowing "wave" profile between muscular front and rear wheelarches, Essence at first appears to be in the classic sports car mould. But there is nothing retro about Essence. The rear section also features complex surfacing with concave "scoops" that flow down the rear pillars from one of Essence's most distinctive design cues: a C-shaped kink to the side windows' trailing edge. Outlined by a wide flourish of stainless steel, it adds instant movement to the car even when it is standing still. One of the most distinctive details is the trim around the side air vents. The simple yet delicate shape, finely finished in aluminium, is based on the "kanzashi", a hairpin used by women when wearing the kimono. Other lines and details are inspired by the wide brush strokes of Japanese calligraphy. Essence represents a successful merging of iconic cultural cues with automotive aesthetics. Essence's front is characterised by Infiniti's signature double-arch grille, set at an angle that suggests the car is about to leap forward. There is an illuminated Infiniti badge at its heart. Rounded corners effectively hide the front overhang and make this 4.7m-long car appear anything but big in the flesh. The grille is framed by subtle strips of stainless steel but there's little other trim and no other grilles or intakes, not even foglights. At the front as over the rest of the car, Essence eschews superfluous body embellishments that could interrupt the graceful strength of the whole. The door handles are slithers of push buttons flush with the body while even rear-view mirrors must make way for minuscule cameras teased out of the A-pillars. The windscreen flows back into a full glass roof that then tapers down towards the boot opening – making just one more memorable view of a car that doesn't have a wrong angle to it. On design, Essence is simple and amazingly complex, classical and totally dynamic all at the same time. Most of all as the epitome of "dynamic adeyaka" it boasts massive presence. Once seen, never forgotten. "Detailed artistic expression and the rich warmth of the human hand go far beyond mechanical precision." For a driver's car, the perfect driver's cabin. Essence's interior is minimalist, ergonomic and totally focused on the job in hand: to give the person behind the wheel a feeling of absolute control. And yet all this driver focus goes hand in hand with a passenger area dominated by comfort, calm and elegance to offer the kind of hospitality that is so important to the Japanese people, and also to Essence. The asymmetrical cabin is divided into two areas separated by a large curving console between the seats that sweeps around to merge with the centre of the dashboard. The result is two very distinct cocoons. The driver's side is themed black, the passenger's "cocoon" an earthy red. Infiniti designers believe the best functionality works behind the scenes, appearing only when needed. They call this "hidden tech", and it's the key to the functional minimalism that dominates the control layout. By not baffling drivers with buttons or overburdening them with information, Essence offers a sense of well-being to everyone, allowing them to focus entirely on enjoying the energizing driving experience. Essence's interior promotes a sense of well-being which is key to the Infiniti driving experience. "Infiniti's performance feel has been captured as natural dynamism, like energy rising from within." Essence's drivetrain is designed to meet the highest expectations of owners by delivering the one thing everyone expects of an Infiniti – sheer driving pleasure. In Essence that pleasure is taken to new heights, at the same time as previewing an innovative green hybrid engine. Essence is unusual even in the rarefied atmosphere of the world's fastest road cars by being able to call on a mighty 600PS (592bhp). The power guarantees high performance responses on any road, in any situation. Essence is not, however, an intimidating sports racer. Like the design, the performance is designed to be sophisticated and unobtrusive – performance with a human touch. The hybrid system is a logical extension of Infiniti parent group's groundbreaking green commitments. It offers power with efficiency, and high performance with zero-emissions running, by combining a petrol engine with an electric motor. These can work independently or together as a "parallel" hybrid system. When the traffic clears, Essence responds with a highway performance that few cars could match. In "power assist" mode the full 600PS is unleashed with both petrol and electric power working together. Infiniti's familiar 3.7-litre V6 gasoline engine is fitted with twin turbochargers, boosting power to 440PS (434bhp). A new direct-injection fuel system ensures the engine works more efficiently than ever in Essence. Optimized energy useage across the widest possible range of driving conditions is guaranteed by two separate clutches which "switch in" the motors as required. It is a system that needs no torque converter, further enhancing responsiveness and driving pleasure. Essence previews some of the next-generation safety features that will ensure Infiniti cars remain among the safest on the road. Chief among them is a "Safety Shield" that goes a long way towards the Infiniti engineers' dream of a collision-free car. The Safety Shield adds two new technologies to the Distance Control Assist (DCA) and Lane Departure Prevention (LDP) systems that are available in today's production Infinitis. Side Collision Prevention (SCP) and Back-up Collision Prevention (BCP) extend the anti-collision shield all the way around the car. With SCP, when the driver decides to change lanes, side-mounted sensors activate a warning if an approaching vehicle is detected in the driver's intended lane. A yaw mechanism is then activated through brake control of individual wheels to help prevent a potential collision. Back-up Collision Prevention works in a similar way, sensing a vehicle behind, giving the driver a warning but then, if the warning is not heeded, activating the brakes automatically. Vuitton first worked with a coachbuilder – the famous Kellner company – in 1908, equipping one of their early luxury limousines with a set of bespoke luggage. Other coachbuilders quickly beat a path to Vuitton's door in Paris. Made-to-measure Vuitton trunks were an integral feature of some of the greatest cars of the first part of the 20th century. The collaboration between Infiniti and Vuitton revives the idea of a set of the highest quality luggage made to fit exactly a car's boot area. In Essence there are three rigid pieces: a matched pair of slender briefcases atop a large trunk. All are made in the new Damier Graphite canvas and feature sleekly integrated handles and an overall design in harmony with the car itself. The idea behind Infiniti was first discussed in 1985 but it wasn't until November 1989 that the first Infiniti model was sold in North America. Today it is the fastest growing luxury brand in the US. Infiniti's success is down to many things, not least the "Dynamic Adeyaka" attitude behind every Infiniti model. When Adeyaka meets The Total Ownership Experience the result is the three pillars of Infiniti: driving pleasure, hospitality and peace of mind. All these values are perfectly summed up by Essence which is revealed at the Geneva Motor Show of 2009 not only to coincide with the marque's 20th anniversary, but also in the midst of the brand's current challenge: to take on the European market.